Happy Monday, friends! I don't about y'all, but the guys on my list are by far the absolute most difficult to shop for! It's like all of the guys get together and decide that they're not going to tell you what they want for Christmas. But at the same time, they look forward to what you're going to surprise them with on Christmas day. That's the way all of the guys in my family seem to operate haha. But I like to think that I've gotten pretty good at surprising them with something special each year. 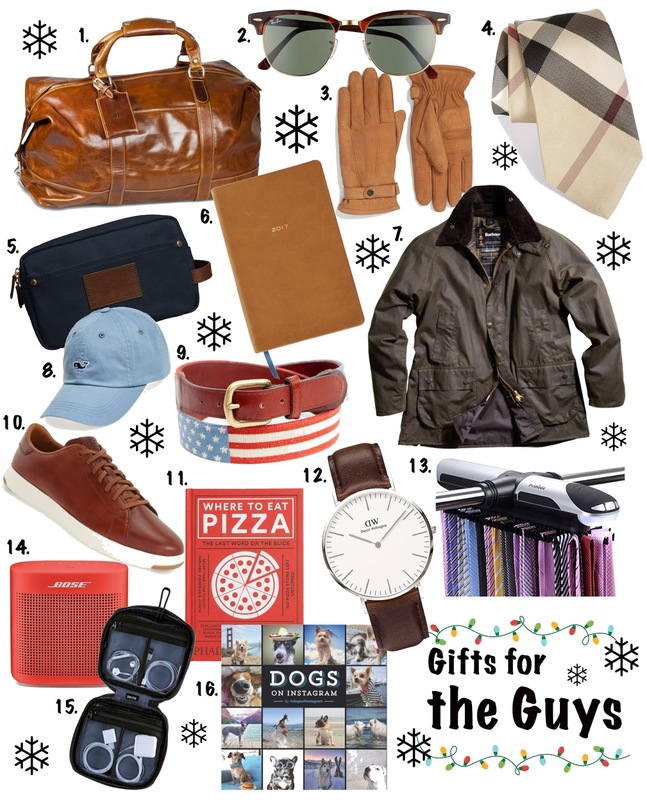 That's why I've put together this perfect "gifts for the guys"gift guide. From higher priced items to lower priced ones, there's something here for brothers, fathers, grandfathers, uncles, husbands, boyfriends, friends...everyone on your list! I think this has to be the most handsome duffel bag I've ever seen for a guy. Every year, my mom and I surprise each other with something special from Barrington, and I think this would be the perfect gift for any guy. I'm obsessed with it! If your guy is in need of some new sunnies (or maybe he just loves getting new sunglasses every now and then), this pair is a classic that will never go out! The tortoise makes them timeless. Every guy needs a good pair of gloves. And since these are Barbour, they are guaranteed to be amazing! They are a great under $100 gift option. I like to call this the tie of all ties! Seriously, it doesn't get much better than Burberry. The signature Burberry checks are a classic that he can wear year after year. Okay this may just be the most practical gift of all because everyone needs one of these! I personally don't know how I'd travel without my (multiple) toiletry bags to organize everything I travel with. Guys definitely need one too. I love this one because it can be personalized. It comes in two colors, as well. The jacket of all jackets...the gift of all gifts...this is it! You simply can't go wrong with Barbour! The guy(s) on your list are sure to love a Barbour. They are a timeless classic that will keep him warm year after year. My dad and granddad both have one of these and have been enjoying them for years now! I could't recommend these enough. This is a great gift idea for the brothers, uncles, friends in your life. The Vineyard Vines whale logo hat is a classic that every guy will love! It's a great surprise by itself, or pair it with another smaller item to make for the perfect gift pair. This belt is amazing!! S&B brand needlepoint is the way to go as they have wallets, hats, key fobs, etc. But I think the belts are the most spectacular of every item they have. Just about every guy on my list would go bananas over this belt. These shoes are amazing and are currently price matched to 30% off! They come in three color options. If your guy loves pizza, then he'll love this book! My dad is currently mourning the closing of one of our local pizza shops (it was amazing pizza, and the owner decided it was time to retire). I'm thinking he may love this book and reading about where to find the best pizza around the globe. This watch it yet another timeless classic that he will wear for years and years. The Daniel Wellington watches are perfection! I have a few and have gifted a few to my dad, brothers, mom, sister, you name it...everyone on my list! They are simply amazing. This bluetooth speaker would be perfect for the guy on your list if he loves music, his iPhone, his iPod, whatever. It comes in four colors and looks to have some amazing features! This gift idea is ideal for so many reasons. It is the perfect travel kit for all of his electronics chargers! My dad is always forgetting to pack his chargers, and this case is a great way to help him remember to pack them all. It's under $50 and comes in multiple colors. Seeing funny dog pictures/videos are guaranteed to always make my dad laugh. This book features 400+ of the funniest, most popular dog photographs on Instagram. It's perfect for any dog lover on your list. Well, there you have it! This list is packed full of great gifts for the guys on your list.